With a long break coming up, Brian and I looked for a long, high-altitude climb to keep us sore for a few extra days. 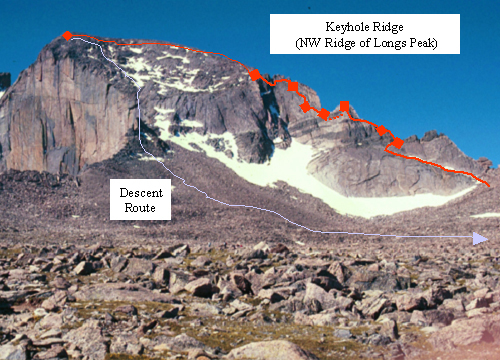 We settled on Longs Peak Keyhole Ridge: a moderate ridge climb with spectacular views and a direct route to the summit. I also had a private agenda; I was going to see if I could avoid dehydration rather than tolerate it. The route included a 7.25 mile one-way hike with a 3,600 foot elevation gain (ranger station to false keyhole) plus 5 mostly adventurous pitches of 4th class to 5.5 climbing. We thought we’d start early despite a perfect Summer weather forecast. We arrived at the full parking lot just before 4am and started out under a clear sky and bright moon right at 4am. Brian and I are still fairly fast hikers, even with a pack full of metal and rope; we reached the first bridge (just before tree line) in 45 minutes, which is a good a speed as we’ve done. We reached the cut-off to Jim’s Grove around 5am and the Boulder Field corral after 2.5 hours. With no small amount of pleasure, we noted that 2.5 hours to the Boulder Field is as fast as we’ve ever done. 4th Class Scramble: to reach the initial climbing section, we scrambled up along the ridge line for about 50 feet. Ridge Tiptoe & Climb to Second Tower: a scary, exposed section of blocks create a 4th class scramble along a 3 foot wide staircase with hundred foot drops to either side; we roped up. This scramble leads to the foot of the 2nd tower. From the foot of the tower, we traversed left (5.2) to reach a steep ramp that leads to the top of the tower. The ramp (5.4) led up to a number of options to reach the top of the tower; we went left to a ledge and then up to the top of the tower (5.5). Downclimb and Ledge Traverse: From the top of the 2nd tower, we descended to the west side of the ridge, down climbing 10 feet to a ledge. The ledge led to a low point between the 2nd tower and the remaining NW Ridge. Scramble to top of ramp: From the saddle, we moved up a broad, low angle ramp to reach a cliff below the NW Ridge. 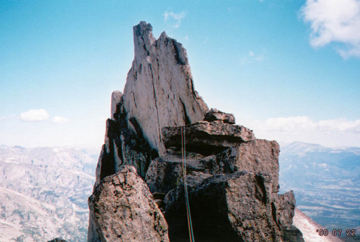 At the end of this pitch, I had a beautiful sit-on-the-cliff-edge, feet dangling belay overlooking the Boulder Field. Scramble & Hike to Summit: We unroped and climbed along the ridge crest. Near the end of the ridge, we dropped down 10 feet to the left to pass the last tower (3rd class). We then scrambled to the summit level. Once we reached the summit block, we had a 100 yard hike to the summit and the masses milling and lounging around like on Miami Beach. On the summit at noon was right on schedule. We rested and I ate a bite of lunch while finishing my 2nd liter of water since the Boulder Field. After our short break, we descended the Cables Route down the north face without incident. Once we reached the corral and our stash, we refilled bottles and bellies with water. As we left the Boulder Field, my toes were already feeling the beginnings of “Fire Toes” syndrome, a very painful friction condition brought on by my newish Makalus. I’ve found that the newer style boots with rubber rands covering the toes will not break in; they insist on breaking in your feet. The hike out of the Boulder Field and through Jim’s Grove was long and hot, but went without any ankle turns. We took a short break after the bridge that reconnects with the main trail, where I finished my 7th liter of water for the day. Trudge, trudge, trudge. It is always the same death march back to the car after a Longs Peak summit. The only sign of aging I can discern is a strong preference for going uphill in the morning; the downhill return is always a dread. My toes felt horribly abused. Still, the time passed relatively quickly due to our use of “Movie Quiz”: a game of guessing movie sources for quotes or naming movies that a particular actor was in. We reached the car at 4pm, where I was pleasantly surprised to find that, once again, the toes were still attached. And, aside from boot tortures, I felt great, thanks to my water guzzling efforts. 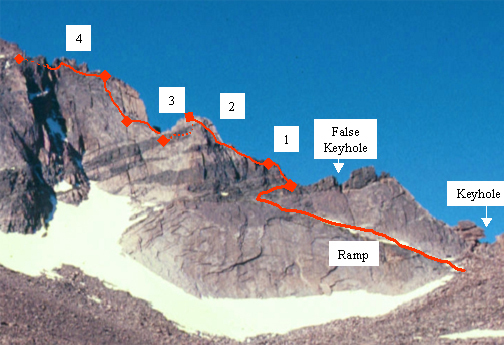 Route Map: Yellow is standard Keyhole route. Our variations are in red.